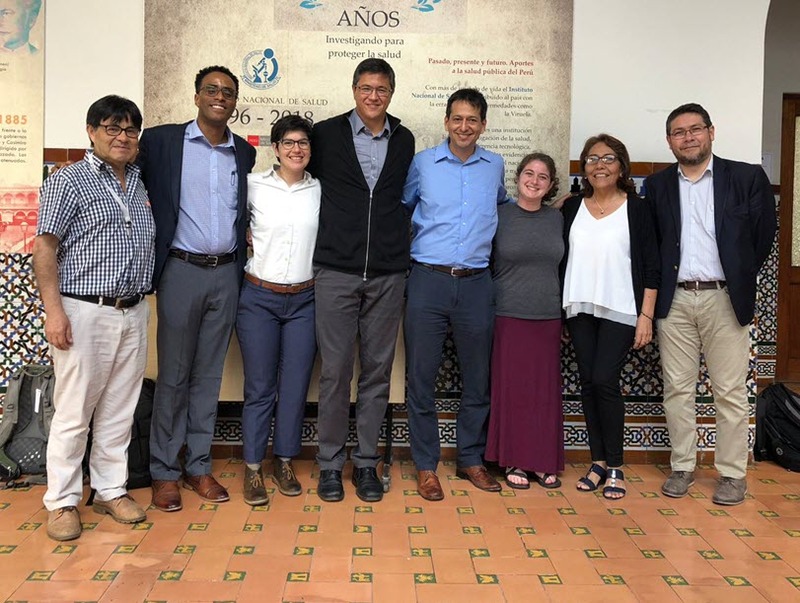 Bass Connections students and faculty met with representatives from the Ministry of Health and Ministry of Environment in Lima to discuss the impact of artisanal gold mining on people and the environment. I’m sitting in an Uber, the car stuck in a long line of barely moving traffic, fancy buildings looming on the right side, and surfers riding the white-capped waves on the left. This scene could be from any American or European city, but it’s not—it’s from Lima, Peru. And while I shouldn’t be surprised to find so many similarities between this Peruvian city and any of the ones that are more familiar to me, my previous experiences in Peru have been so starkly different from this, that I can’t help but be a bit astounded. This is my third trip to Peru, yet my first visit to the capital—normally, I spend my time purely in the Amazonian region of Madre de Dios. It is estimated that over 45,000 people take part in artisanal gold mining in this region. In their quest for gold, miners emit annually an estimated 30-40 tons of mercury into the environment, destroy an estimated 4437 ha of forests, and load enormous quantities of sediment into the river. In turn, humans and animals living in the region are beginning to face the consequences—elevated mercury concentrations in indigenous communities, decreased populations of fish in the river and loss of sensitive species. I have come to Lima as part of a Duke Bass Connections team to meet with government officials, NGOs, and reporters. Other members of the team—Dr. Bill Pan, Dr. Ernesto Ortiz, and Chris Lara (mid-career fellow of the Master of International Development Policy)—have spent the last few months coordinating these meetings, so that we can share with the results of previous research on artisanal gold mining in Madre de Dios. This region is one of the most well-studied areas globally on the impacts of artisanal gold mining, with twenty-two articles published in peer-reviewed journals, including several by Duke researchers. Yet, the majority of these articles are locked behind paywalls or contain scientific jargon that make it difficult for Peruvians to access. Our team has therefore compiled a two-page science brief, a complete annotated bibliography, and a website that allows for this important information to be more available. As we enter each meeting, I prepare to learn about engaging science with policy by observing the interactions between meeting attendees. I am accompanying Lara, who has extensive experience working with policymakers and whose role on our team is to connect the science with the policy. He takes the lead during the meetings—introducing us, our project, our work and our goals for future interactions. I use this as an opportunity to learn communication best practices outside the world of scientists, stepping in as necessary to explain in greater detail our scientific methods and hypotheses, as well as the implications of previous scientific findings, but mostly just making mental notes to guide future interactions I hope to have. When we leave the meetings, there is generally a positive attitude in the room. Our new collaborators are excited to receive the information that we provide and for the promise that we will share our results with them. And we, for our part, are glad to find that our science can be used to inform policy decisions. There is definitely still room to improve—I’d love to sit in a room developing a research agenda in conjunction with policymakers—but the first leap of bridging this science-policy gap has been taken, paving the way for future steps that will take this collaboration even further. This research is part of a Bass Connections at Duke project.